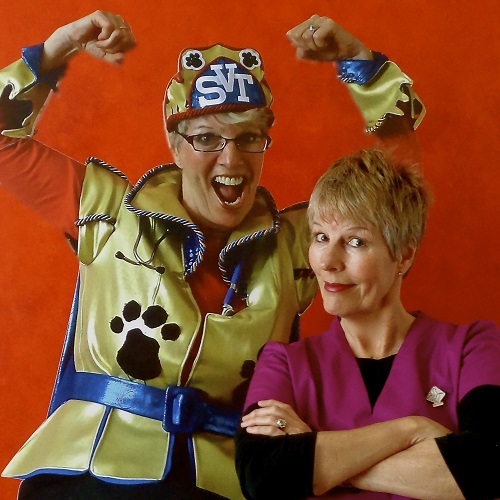 The DYNAMIC DUO of Writer/Performer Sandra Lean-Leighton and Producer/Technician Pauline Tetley are going on tour with “Adventures of a SuperVet Tech” to 3 Ontario Colleges in 10 days; Ridgetown College March 30th, Algonquin College, Ottawa April 1st and St. Lawrence College, Kingston, April 8th. As always, this has fun written all over it. Come to “Laugh Your Tail Off”, a fund-raiser March 16th in Kingston! Come out and support the St. Lawrence Vet Tech Students and the Kingston Humane Society. It will be a fun filled evening with tons of laughs and excellent company. I won’t be performing that night but I’d love to meet you all. Tickets are $10 (please see Holly Taylor or Satori Hiramatsu ) to pre-order. Sandra is an actress with 21 years of experience and also has 20 years experience as a Registered Veterinary Technician. She has combined these two careers and written a one woman show about the daily trials and tribulations of a Veterinary Technician with a comedic twist. The show is meant to inspire future Vet Techs and share how the daily life of a Vet Tech can be crazy, full of surprises, physically & emotionally challenging, but also very rewarding. The goal of this show is to provide Vet Tech students with beneficial advice on how to be the best Technician you can be, prepare them with a few stories of common situations they can expect, also and how to deal with potential challenges. Our goal is to raise enough money to cover the cost of having Sandra perform at our school and also to provide some refreshments for during the performance. However, we anticipate raising over and above the amount needed. So any money raised that exceeds our goal for the show will be donated to the Kingston Humane Society on behalf of the St. Lawrence Vet Tech Students. 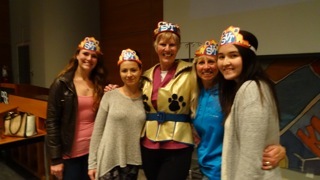 I am delighted to announce that another Ontario College has signed onto the “Adventures of a SuperVet Tech” Ontario Tour. St. Lawrence College in Kingston, Ont. has confirmed a show on April 8, 2016. Thank you Paula Kirkwood-Zahara and vet tech students Satori Hiramatsu and Holly Taylor for helping to put it all together. I can hardly wait to share the fun. The performer-slash-veterinary technician uses comedy to teach us about an often overlooked — but vitally important — profession. 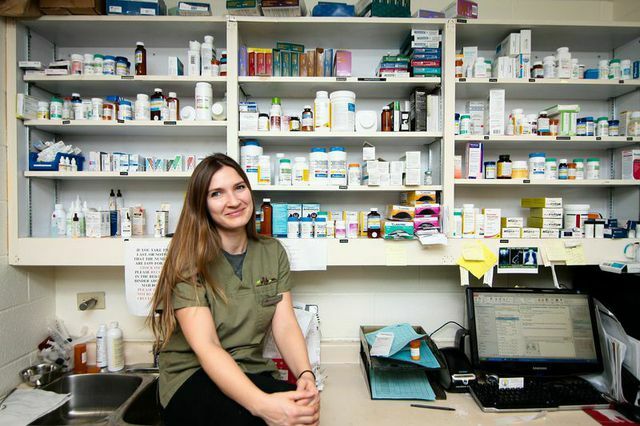 Most dog owners have logged a number of hours at the veterinarian, but they may not be aware of a key player at the vet’s office: the veterinary technician. This is the person whose name you might not know but who you often see assisting the doggy doctor with all sorts of things, from X-rays to small surgeries. It’s one of the fastest growing professions out there, but there’s a lot most people still don’t know about it. 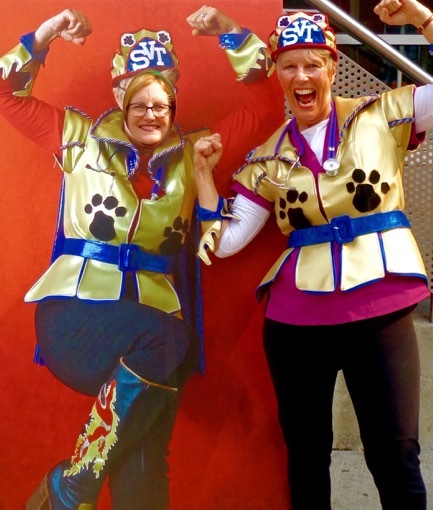 Given that many of us aren’t incredibly familiar with the role these professionals play in the lives of our beloved pooches, Sandra Lean-Leighton, a trained technician, has made it her mission to educate the public, with a healthy dose of humor. The result is a one-woman comedy currently touring colleges and conferences in Canada and the U.S. called Adventures of a SuperVet Tech. To get an idea of Lean-Leighton’s style, check out her four-minute YouTube video “Believe It … Behind the Furry Curtain,” which she posted two years ago as she was first introducing her unique perspective to the wider world. Aside from conducting lab work, ultrasounds, and administering medications in clinics, shelters, wildlife facilities, and anywhere else animals are found, vet techs deal with some fairly absurd situations on a regular basis. As Lean-Leighton tells it, she’s encountered a German Shepherd whose owner was convinced his dog could read his mind, a geriatric pooch with missing teeth whose owner pre-chewed all his food, and a dog whose ear infection was improperly treated with oral antibiotic pills shoved into his ear canal. It’s doesn’t stop there. Imagine for a moment changing an ear bandage on an uncooperative and brawny Great Dane, or eating your lunch while crouched down in a cage because you need to monitor an animal coming out of anesthesia. Plus every other emergency or high-stress situation, like nursing gunshot wounds in dogs who found themselves in the middle of a drug deal gone wrong or grief counseling those who are euthanizing their pets. This is the material Lean-Leighton has to work with as the person who’s essentially the go-between for the animal and the vet. And it’s also about having a strong stomach, a big heart, and a keen sense of humor – the three essential attributes that Lean-Leighton credits vet techs with having. Of course, SuperVet Tech can do some pretty amazing things, too. Like smell a parvo puppy from miles away and take an X-ray without a machine. But the act isn’t all stand-up comedy. It’s also about instilling pride in the audience of technicians and acknowledging the emotional and physical demands of the job – while wearing headgear, a cape, and funky boots for added entertainment value. Currently, Lean-Leighton is looking for sponsorship so she can spread the word about her beloved profession and potentially raise funds for local shelters. And although she doesn’t have a dog at the moment – working 12-hour shifts makes cat ownership the better option – she had a pup when she was younger who died of distemper. “That made me wish I could have done something,” she says. Today, Lean-Leighton has worked in more than 40 clinics and with more than 120 veterinarians, and Adventures of a SuperVet Tech is introducing her to hundreds of other professionals who she’s helping to inspire. In her mind, every animal is really special; it’s just a matter of figuring out what it is that makes each special. And the same can be said of her. Who else would dress up like a mock superhero to spread awareness of the joys and challenges of her beloved profession and those she helps on a daily basis? It’s safe to say she’s doing something truly spectacular for the vet tech field and for the animals as well. About the author: Whitney C. Harris is a New York-based freelance writer for websites including StrollerTraffic, Brides.com, and WhattoExpect.com. A former book and magazine editor, she enjoys running (with her dog, Finley), watching movies (also with Finley), and cooking meatless meals (usually with Finley watching close by). She and her husband (and Finley, too) welcomed a baby girl named Rowan in August. The show re-ignited my student’s passion for the profession and she felt much more confident in moving forward with pride and excitement. She wanted to make sure that we knew how helpful the show was to her and thanked us for arranging your visit. I think that is proof-positive that you are achieving your goal of encouraging and inspiring these students! I was watching the students (and our staff) through the show, and lots of smiling, nodding and genuine enjoyment was evident! Diane Boyle DVM Douglas College, Coquitlam, B.C. Continuing on the 2016 Ontario Tour of “Adventures of a SuperVet Tech”, I am delighted to announce that I will be performing at Ridgetown College, Ridgetown, Ont on Feb 24th. Can’t wait to share the fun! Being a registered vet tech is not for sissies! Every vet tech needs 3 essential attributes; a strong stomach, a big heart and a keen sense of humour. Man, if you can’t laugh at the absurdity of some situations, you are dead in the water. But, if you’re the kind of person who doesn’t mind their hands looking like roadmaps from scratches and bites and not just from clients who get an estimate, or thinks nothing about owning 3 cats, 2 dogs, 1 rabbit and 5 gerbils, all rescue cases, or spend more time at work on your hands and knees than……..well other professions, or if you can pick up a piece of poop with your bare hands without thinking about it, you probably have what it takes to be a vet tech. 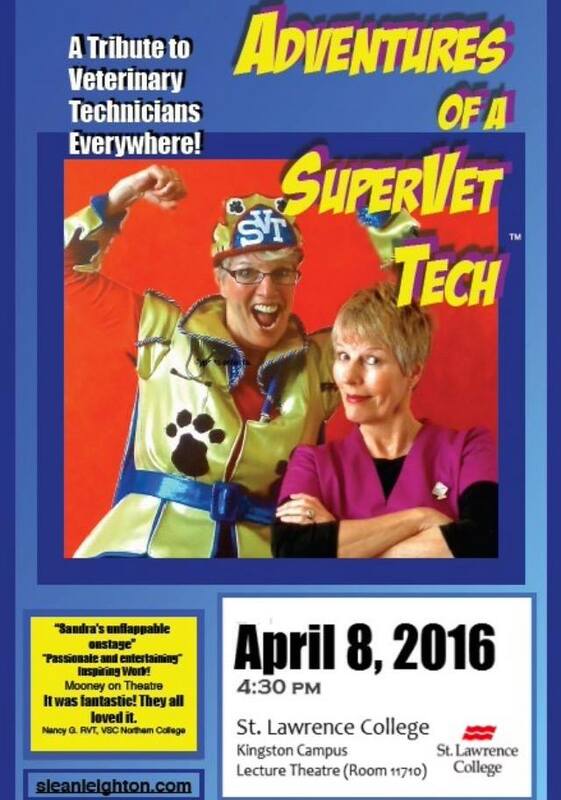 But what makes a veterinary technician a SuperVet Tech? Well look at Batman, he doesn’t have superpowers, but just like him we’ve got the skills to operate the fancy gadgets and machines. Heck, we do lasers, X-rays, ultrasounds, cat scans. And just like Spiderman’s and his Spidey sense. We have something I like to call “SuperSenses”. First off, there’s common sense, to singlehandedly fight chaos when all hell breaks loose in the treatment room. Then there’s the sense of sight, to be able to see when an animal is in pain and needs medication. Or the sense of smell, to be able to detect kidney failure on a cat’s breath. Or the sense of hearing, to be able to hear a heart murmur on a little kitten, or the sense of taste, …… honestly, haven’t I grossed you out enough already? And most importantly, the sense of touch. To touch the heart of a grieving owner and know just the right thing to say. That, my friends takes super sensitivity. No, with the combination of our experience, skills and SuperSenses, the truth is, all Registered Veterinary Technicians are SuperVet Techs. And you don’t need a cape and funny boots to prove that. When I was an actress and attending a party, someone would ask the inevitable question, “What you you do?” When I told them I was an actress, you could see the feeling of excitement rising up in them. ” Have I seen you in something? Who have you worked with? Are you famous?”. Nowadays, when at the same kind of party and the same kind of question comes up and I say “I am a Registered Veterinary Technician”, it’s a very different response. ” A what?” Some are polite enough to fain interest and slink off while others start going on and on about how expensive their last vet check-up was. I am neither surprised nor disappointed. But what does amaze me is the feeling I get when I state my profession. A warm glow wells up in me and I have a rush of immense pride. And it’s the memory of that feeling that keeps me going through the many challenges I face daily in my work: and there are many; the physical and emotional demands of the job, the relatively low pay and lack of recognition. 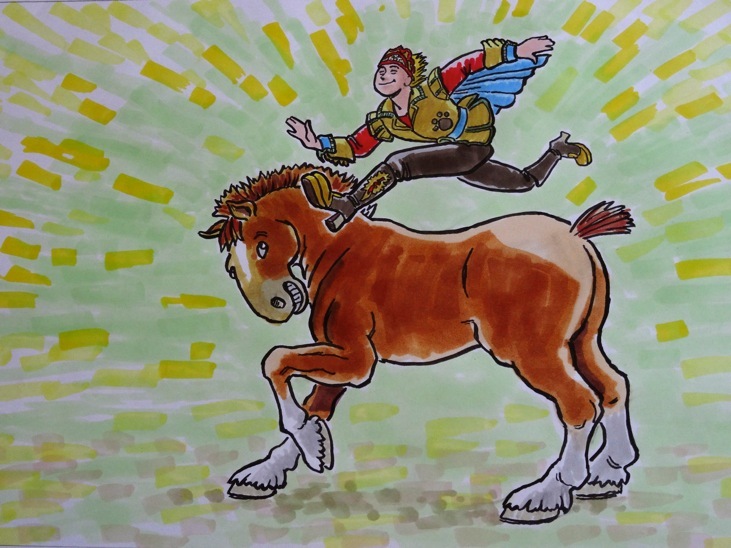 Hey, every job has it’s downside and I could go on and on……..but instead…Here’s the good news. Now, I’m going to be throwing some numbers at you so hold onto your seats. Look at the career websites out there. 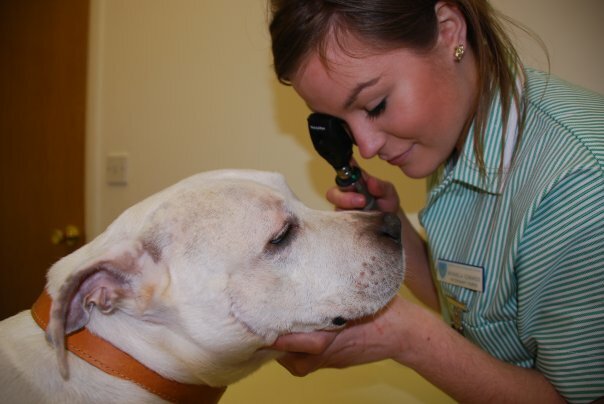 Veterinary Technology is one of the fastest growing professions there are. One says the need for RVTs will increase by 30% in the next 5 years. And get this, a recent scientific veterinary journal says a good RVT can increase the income of a veterinary practice by as much as $93,000 a year. Those are big numbers and make no mistake, vets are starting to take notice. 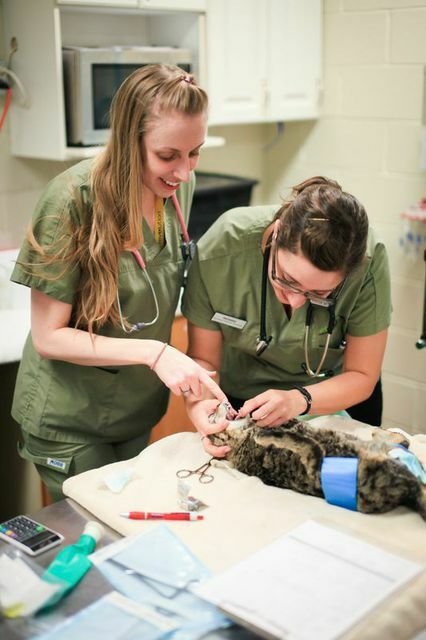 Fully accredited Registered Veterinary Technicians earn 21% more than the unaccredited ones. There’s incentive to stay in school, huh? My friends, the future looks very bright. There are 12 different veterinary technician specialties such as Emergency Clinical Care, Large Animal, Squirrel Gynaecology…… not really Squirrel Gynaecology, just making sure you’re still with me.. But you get my point…… Our professional associations are working very hard on promoting us to the public. And that is key to our future. Hey, this is a great time to be a Registered Veterinary Technician. 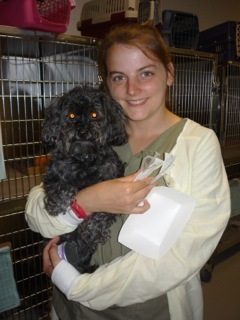 I can’t tell you how honored I am to be among the ranks of Registered Veterinary Technicians. So for a moment, let’s give them the stage.